Everyone loves cupcakes. The only thing that could make a cupcake better is a surprise Indiana Grown filling. These sweet treats are perfect for any summer get together and are easy to make! Enjoy making this recipe with some Indiana Grown preserves! Follow directions of your chosen cupcake mix, let cupcakes cool. With the handle of a wooden spoon, or knife, press into the center of the top of the cupcakes to make an inch deep hole. Stir preserves to loosen them up, then scoop a heaping tablespoon into the hole of the cupcake. 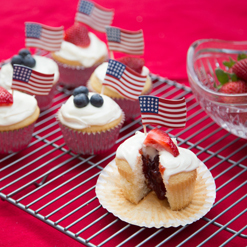 Once cupcakes are filled, ice them, add fresh fruit and a fun garnish like our little American Flags. Photo and recipe courtesy of Dillman Farm.